The author will show you their secret and on the way show you a business model that actually works every day. 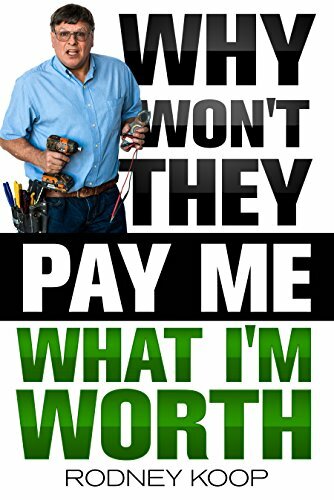 Best Seller Publishing announces the release of Rodney Koop’s new book, “Why Won’t They Pay Me What I’m Worth?” It will be available for free download in the Amazon Kindle Store on June 19th. Putting the profit into a service company requires understanding why people won’t pay you what you are worth. Your price is your power and cash is king. In home services like plumbing, electrical, heating and air, pest control, carpet cleaning, roofing, siding or whatever you do can be not only profitable but pleasant for you and your customer. After 20 years struggling and trying to get technicians to sell and up sell in the homes Rodney Koop finally found the solution. Sell them exactly “how” they already buy every day. Amazon, Best Buy, Home Depot, don’t they make it look easy. I’ll show you their secret and on the way show you a business model that actually works every day. “Why Won’t They Pay Me What I’m Worth?” by Rodney Koop will be free and available for download on Amazon for 5 days (06/19/2017 – 06/23/2017) at: https://www.amazon.com/dp/B071WMXQKP. “Rodney has lived this Story and shows us that there is Hope! The life of a contractor is the life of a tragic Super Hero and most of us end up broken and dashed against the reality of lowest bid gets the job which leads to being broke with no super powers remaining - Thank God for Rodney Koop and his wonderfully supportive family that have kept him going!” – Laura M.
For more questions or to schedule an interview about this press release please contact Rebecca, Author Liaison, at (626) 765-9750 or email info@bestsellerpublishing.org . Rodney Koop has been in the industry for 40+ years and a business owner for over 3 decades! He brings a wealth of knowledge and an understanding of consumer purchasing habits that is literally unmatched. Rodney will be there to explain how and why The New Flat Rate works and to provide training and support related to current members. Rodney is most passionate about his wife, 9 children, boating and, more recently, four-wheeling in the mud.